Vista is devoted to enhancing skills development and decreasing challenging behaviors for children and adults affected with Autism Spectrum Disorder and other developmental disabilities. Vista offers customized programs to teach essential skills to help these individuals integrate into society. Serving Greater Los Angeles County. For 12 years Vista Center for Behavior Analysis (Vista) has been a leader in providing Applied Behavior Analysis (ABA) services in Los Angeles County. 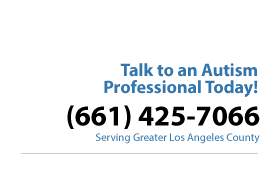 Vista customizes ABA programs for children, teens and adults with Autism Spectrum Disorder, as well as other developmental disabilities. Vista is dedicated to enhancing the life skills of your son or daughter through adolescence and adulthood. Our goal with every individual is to establish the live skills required for independent living and for leading a fulfilling life. We partner with you to provide high quality, comprehensive, and individualized services, based on your goals and the principles and research derived from ABA. Vista’s Child Program is accomplished in increasing skill development and decreasing challenging behaviors that are often seen in early childhood development. Vista embraces the philosophy that parents and other caregivers need to be active participants in treatment programs, to facilitate progress and success for their loved ones. Most parents with autistic children worry about their child’s future. At Vista, we help you find relief for your concerns. To learn more about our programs, please contact us directly and we will begin to answer your questions and assess the appropriate path for your child. Addressing the Needs of Adults. Living Skills are those skills associated with independent living, like food preparation, household chores, laundry, personal hygiene, safety, healthcare and making purchases. Social Integration Skills involve interactive conversations, making appropriate decisions, dating and sexuality, and engaging in social and recreational activities. Vocational Skills are those skills that are focused on preparing for employment, obtaining employment and maintaining employment. Our initial consultation is designed to address your questions, relieve some of your stress, and recommend an appropriate path for your young adult.